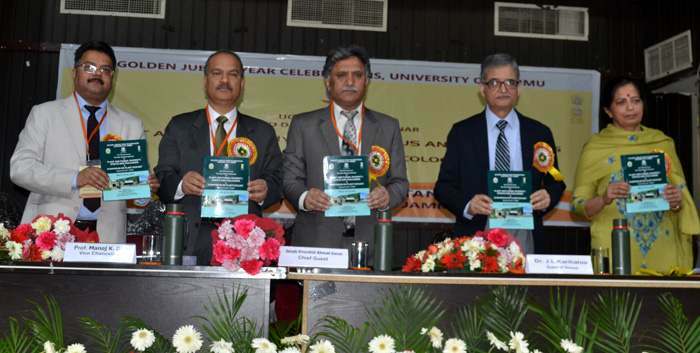 A two day UGC-SAP sponsored National Seminar on “Plant and Fungal Diversity: Status and Challenges and Symposium on Plant Ecology” commenced at Department of Botany, University of Jammu. Jenab Khursheed Ahmed Ganai, Advisor to Hon’ble Governor, the chief guest on the occasion recounted the contributions of eminent researchers and teachers in holistic development of science and environment. He further said that biodiversity both of plants and animals is indispensable for human survival and therefore it should be our priority area to work on. Showing concern regarding the dwindling State of forests cover in Jammu & Kashmir, the Advisor opined that there is an ardent need for documentation and inventorisation of the bioresources by all the research institutions of the State. ‘A symbiotic interface between Universities and Agricultural institutions to plan strategy to conserve biodiversity is the need of the hour”, He said. He also assured the University of Jammu of all possible support from the state administration to go in for management plan for protecting the state bioresources for posterity. He appreciated the achievements and accomplishments of the University of Jammu, in general and the Department of Botany, in particular. Jb. Ganai also stressed on Solid Waste Management in the State and in that direction suggested that the University of Jammu should devise the strategies for finding solutions to the scientific disposal of the waste management. In his keynote address, Dr. J. L. Karihaloo – Former Director ICAR- NBPGR, New Delhi talked about unique qualities and potentialities with respect to yield, quality and adaptability of the land races and wild crop relatives including rice, barley, apple, alliums, saffron, seabuckthorn etc. He gave an overview of the systematic collection and long term conservation measures of germplasm in the wide range of these species. Dr Karihaloo further said that a multidimensional procedure including cryopreservation, gene banks, seed banks etc., are suitable tools for conserving the species of interest. Prof. Manoj Dhar, Vice Chancellor, University of Jammu in his presidential remarks said that University of Jammu hs initiated a major project with the support from Dept of Biotechnology (DBT), Govt of India to conserve 450 varieties of apple collected from Kashmir Valley, Himachal Pradesh and Uttarkhand at Bhaderwah Campus, which will be made available for further research and for development of horticulture. Prof Dhar talked about the importance of fungi in plant and animal world and gave an updated data about the diversity of fungi and plants world over. He further added that on the basis molecular techniques now it is revealed that fungi are more close to the animals than plants. Prof Dhar further said that specific grant have been earmarked for the Dept of Botany for infrastructural development and for curricular revision to raise level of the Dept to the international standards. 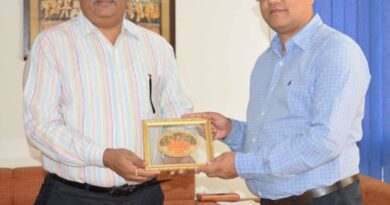 Prof Dhar said that University is planning to establish Research Innovation Cluster in Jammu University under RUSA, wherein research on biodiversity can be conducted using modern tools. Prof. Namrata Sharma, Head of the Department and Organizing Secretary of the Seminar and Symposium welcomed all the guests and delegates in the University of Jammu and spoke on the relevance of such gathering in the development of research and academics. During the inaugural function, rich tributes in the form of a documentary prepared by Dr. Harish Dutt were paid to Late Prof Shashi Kant, an accomplished academician and an ace administrator of the Department of Botany. University of Jammu also paid rich tributes on the untimely passing away of Shri Manohar Parrikar, Chief Minister of Goa. Two minutes of silence was also observed . Prof Yash Pal Sharma, Coordinator UGC-SAP DRS II and Convenor of the Seminar outlined the activities and achievements of the Department of Botany and also highlighted the objectives of the UGC’s Special Assistance Program (SAP) sanctioned to the Department of Botany for 5 years (April 2018 to March 2023). Proceedings of the program were conducted by Dr. Harpreet Bhatia.